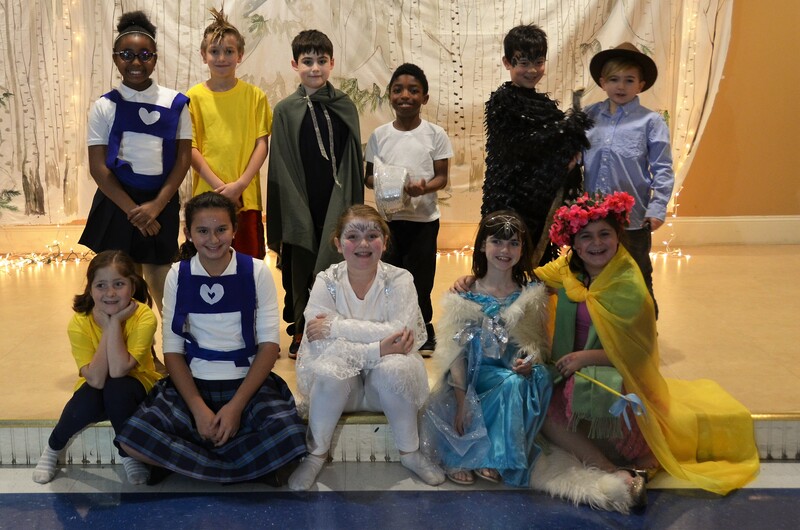 Boston Community Collaborative is so proud of its students who performed “12 Months with the Snow Queen, A Salute to the Seasons” on Sunday at the St. John School stage. The play included approximately 60 students ages 3-10 from our weekly dance and drama classes at the St. John School afterschool program, and at the BPS Eliot School. This original play was written, directed, and choreographed by BCC’s lead drama and dance instructor, Ingrid Oslund. Miss Ingrid combined a Russian folk tale of the Season family discovering the 12 months with the Nordic tale by Hans Christian Anderson, The Snow Queen. A lovely, festive reception followed the show and included donated Regina Pizza, and a Ginger Bread men decorating station from Lulu’s. BCC is delighted to continue to create opportunities that mix kids from different contexts in the neighborhood. Our SJS students may know our Eliot School students thru the Nazzaro Center, from sports, from their respective neighborhoods, from the playground, from their daycare long ago – it is a thrill to bring them all together in collaboration. January 2018, start of winter session of classes. February 16 and 17, Auditions for “A Midsummer Night’s Dream”, our Spring 2018 Mainstage show. This will be a collaboration between professional actors and our students. Spring, 2018, annual neighborhood egghunt. June 1 and 2, 7 pm, “A Midsummer Night’s Dream”.